Jeaniene Frost’s story, One for the Money, features vampires Cat and Bones trying to protect a spoiled heiress with a price on her head and an undead hitman on her trail. Previously published in Death’s Excellent Vacation. Also includes the first three chapters from Jeaniene’s story in The Bite Before Christmas anthology, as well as a sneak peek at ONCE BURNED, the first novel in the new Night Prince series. Mix a spoiled rich brat with Cat and Bones on bodyguard duty and what do you get? A great short little story written by Jeaniene Frost. One for the Money takes place between books 4 and 5 of Jeaniene’s Night Huntress series. Cat’s Uncle Don has asked Cat and Bones to keep Tammy safe, a young heiress whose inheritance will go to her slimy cousin if she dies before she turned 21. There have already been a few attempts on Tammy’s life and, as a favour to a friend, Don has asked Cat and Bones to keep Tammy safe while he and his team find the cousin and lock him up. I found this story to be a quick and fun read. 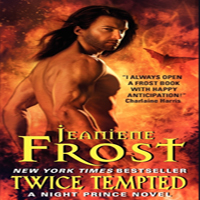 I think you would still get something out of it if you read it without having read Jeaniene’s Night Huntress works because she does do a good job recapping things, but of course you will drool more and cheer more if you have read them. Cat and Bones are amazing characters. They are so well developed in Jeaniene’s books that you can’t wait to get your hands on the next book as soon as you close the previous book. Little short stories like this one are great for that. You get a good look at our favorite couple – you even get a steamy scene in here – and you get a fantastic story too. A story you can read in one sitting as long as the kids don’t find you. A story you’ll want to read in one sitting so you’ll happily hide in your closet with a book light in order to get it done. Fans of Jeaniene’s Cat and Bones will want to check this one out. And newbies will get a great taste of the series too. Also includes first two chapters of FATE’S EDGE, book 3 in the Edge series, and first two chapters of Magic Grieves, a Kate Daniels novella. I remember reading that Ilona Andrews was writing the story of how Kate met Saimon for an anthology quite a while back. I remember wanting to buy this anthology. I remember writing it in my book planner. I also remember not going to the store to buy said anthology. Why? I can’t really say. But I still really wanted to read the story of Kate and Saimon. If you’re like me then you’re in luck because you can read it in Magic Graves now! I have always been intrigued by Saimon, the smug egotistic shapeshifting character who steals every scene he’s in in Ilona’s Kate Daniels series. You get a good taste of him Magic Strikes – you almost feel sorry for him then – but in A Questionable Client, you most certainly do not. He put himself in this situation…and boy what a situation. You will have to read the story to see what I mean because it is really explained well and how Kate reacts to it all it is quite giggle worthy. Just another reason I adore Kate so much! A Questionable Client takes place before the Kate series even begins so there is no Curran. But with Saimon there, you won’t miss him. 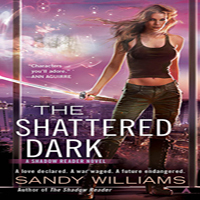 This is a great story and Kate and Saimon’s personalities are well represented. 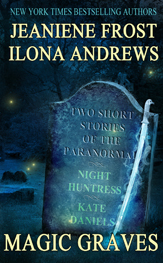 So even if you have not read the Kate Daniels’ books, you can still read this story and get a good taste of what you would be seeing in Ilona’s amazing series. One extra super plus to this anthology is all the extra bonus material that it comes with! There are chapters and excerpts for Jeaniene’s and Ilona’s upcoming works, including a peek at the first Night Prince book, Once Burned, and a decent chunk from Fate’s Edge! I’m not one to usually read snippets, but I must admit that I read those two. And now I’m drooling. Overall, Magic Graves was a fun read. Both stories made me smile and both I will most likely pick up again someday. Share the post "Review: Magic Graves by Jeaniene Frost & Ilona Andrews"
Thanks for the great review. I still havent started the Kate’s books yet. I saw this book and wondered about it. Excellent recap. I am always interested in a new Cat and Bones piece! this book sounds great ! I really love the two authors ! Thanks for the review, I will add it to my wishlist ! Melliane – These are two of my fave authors too! What a snuggle bug!!! Charlie still sepels in his crib in just his clothes with a couple tiny socks to hold onto! I tried to give him a blanket once and he kicked it all off! When I’m all toasty in my bed I sometimes feel guilty for that… but he seems to sleep just fine like he is!! I believe with this to reach about obtaining nuances of unpaid in add-through to it seems to arrive about acquiring composed so concerning produce the various readers considers. I like your enhancing design and style and appreciate your time and effort.